Hemophilia - body, contagious, causes, What Is Hemophilia? Usually, female "carriers" have normal levels of clotting factors themselves. If a man with hemophilia marries a woman who is a carrier, there is a possibility of having a daughter with hemophilia, but this is rare. Up to one third of the people with hemophilia have no family members who have the condition or who are carriers. In these cases, a mutation (a change in a gene) has produced a new hemophilia gene, which may be passed on to following generations. Joint bleeding is serious, because it can lead to arthritis (inflammation of the joints), deformity, and disability. Prompt treatment is necessary to prevent severe pain and swelling. As boys with hemophilia grow older, they often learn to recognize joint bleeding before the pain or swelling appears as a "funny," tingling feeling. A chromosome is a paired, thread-like structure found in the nucleus or central, controlling part of the body's cells that determines the development of characteristics for each individual person. The one obvious characteristic to be determined is whether a person is male or female. A female has two X chromosomes, and a male has one X and one Y. Bleeding into a muscle, most often the calf, thigh, or forearm, commonly occurs after injury; sometimes this occurs spontaneously. The resulting swelling, which may develop over several days, may create pressure inside the muscles and damage nerves and blood vessels. Symptoms include muscle tightness, pain, skin temperature change, and tingling or numbness. Early treatment is needed to prevent paralysis or permanent immobility. History's most famous carrier of the gene for hemophilia was Victoria (1819-1901), Queen of England and grandmother to most of the royalty in Europe. In 1853, Queen Victoria gave birth to her eighth child, Leopold, Duke of Albany, who had hemophilia and died at the age of 31 from internal bleeding after a fall. Two of Queen Victoria's four daughters, Alice (b. 1843) and Beatrice (b. 1857), also carried the gene for hemophilia and subsequently transmitted the disease to three of Victoria's grandsons and to six of her great-grandsons. Alice's daughter Alexandra also was a carrier of hemophilia, and she transmitted the disease to her son Alexis (b. 1904), whose father was Czar Nicholas 11 (1868—1918) of Russia. Alexis is perhaps the most famous of the European royals with hemophilia. Alexis was the heir to his father's throne and his medical condition caused much anxiety in the royal household. Historians are still discussing the role Alexis's condition played in the Russian revolution of 1918. 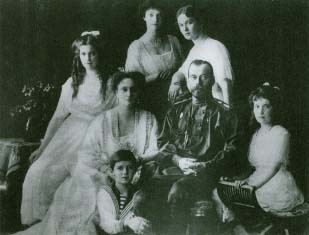 Czar Nicholas II of Russia and his family, photographed c. 1916, showing his wife Alexandra (who was a carrier of hemophilia), his four daughters, and (in the foreground) his son Alexis, perhaps the most famous European royal with hemophilia. Clotting factors are transfused through the vein, often at a hospital or doctor's office. With proper training, people with hemophilia or their parents can perform transfusions at home. 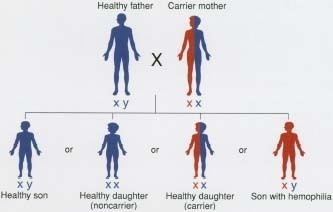 Using DNA testing (direct analysis of the genes), it is possible to determine whether a woman is a "carrier" of the hemophilia gene. Blood tests can measure the level of clotting factors in the blood. Tests can be performed on fetuses to see if they have inherited hemophilia. People with hemophilia often need to be given the blood-clotting factors they lack. These factors may be drawn from the blood donations of many people and purified. Or, since the mid-1990s, they may be produced by genetic engineering, which does not require blood donations. The clotting factors are transfused through the person's vein, often at a hospital or doctor's office. With proper training, a person can perform transfusions at home, or parents can do it for their children. One medication that should not be used by those with hemophilia is aspirin, a pain reliever, since it interferes with normal blood clotting and increases people's tendency to bleed.